As saxophone players, we strive to play beautiful melodies and take killer solos right? You may be surprised to learn that it is not as difficult as you may think. The key lies in a simple method that I can’t wait to share with you. This post is a quick guide to learning to play sax by ear. First, let me introduce myself. My name is Jay Metcalf. I’m a professional saxophone player, educator and repair technician. I have been studying the saxophone for the last 30 years and performing professionally for more than 20 of those. I would like to share some of what I have learned with you. 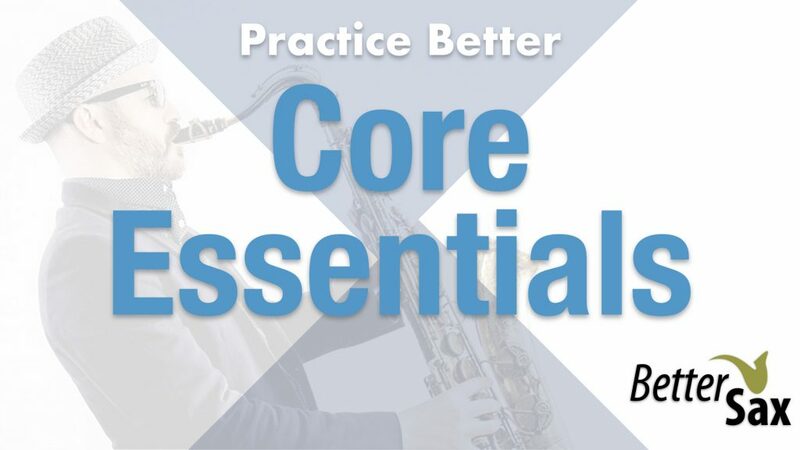 This process works because it is only a slightly simplified version of the same exact process most soloists and improvisers use to make the incredible music you hear on their recordings. We have just limited ourselves to the pentatonic scale to begin with. To be honest though, some of the most successful soloists on any given instrument have limited themselves to playing almost exclusively from the pentatonic scale as well, and they have gotten amazing musical results. The pentatonic scale is the melodic foundation for just about every style of music out there. It is the most commonly used group of notes in all popular music styles, and is used extensively in jazz and classical music. The reason for this probably has a lot to do with our natural human connection to this sequence of tones. Once you start working with this scale, you’ll see how quickly it becomes ingrained in your ear and brain. 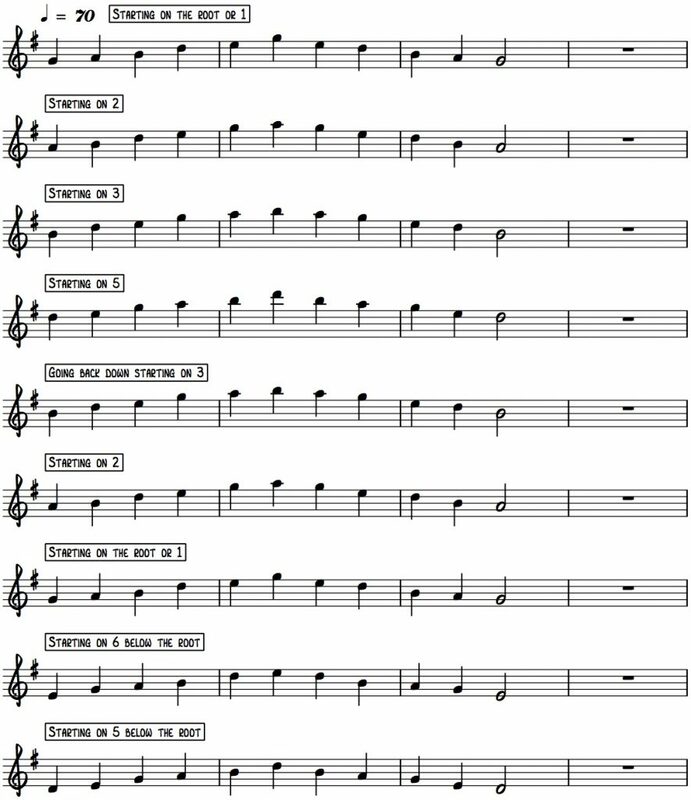 You’ll also be surprised at how much of the music we hear every day is mostly composed out of these 5 notes. Your sound is the first thing that people notice when you play. There is no other element of your playing that has as much of an effect on a listener. So, as much as we’d all like to play lots of impressive notes up and down the horn, if our sound is not happening, nobody will want to listen. Sound is something that all saxophone players work on every time they put their instrument in their mouth. We should be thinking about this and listening critically to our own sound with every note we play. Do not neglect this crucial part of the equation. There are many factors that affect your sound from equipment to air stream to embouchure and more. In short, I would say the overall best thing you can do for your sound is play the saxophone a lot. Playing the saxophone requires the use of all the muscles in your face and mouth. If you haven’t played for a few days (or longer) you’ll find that these muscles will tire more quickly, and when they are tired, your sound will suffer and intonation will be off. Playing everyday, even if it’s just a quick 15 minutes session helps keeps your embouchure muscles in shape. It may sound very simple, but blowing the horn everyday has a very positive result on every aspect of your saxophone playing. You need to have a good mouthpiece and reed setup to get the most out of your horn. No need for anything really fancy here. Good solid equipment that works well is the best. You’ll be able to shape and personalize the sound yourself over time. Don’t believe any hype about a particular product that says it will give you the Michael Brecker or David Sanborn sound. Those players would sound like themselves on any good equipment and so will you. Make sure that your mouthpiece is not damaged in any way. A chip or dent on the tip, rails or table can cause problems. A ligature needs to fit properly and hold the reed tightly in place. If it does those 2 things, it’s a good ligature. Yes, they can affect the sound insomuch as they have an effect on how your reed vibrates on the mouthpiece. This effect is subtle and only noticable once you’ve developed your sound to a fairly sophisticated level. Again, no need for the anything super fancy. Take good care of your reeds, and most importantly, put them on the mouthpiece meticulously. I am amazed at how many people just slap their reed on and go for it. On the saxophone, the closer any part is to your mouth, the more important it’s function. The interaction between your reed and mouthpiece is the most important mechanical process on your instrument. Watch my YouTube video on this subject and download my Essential Reed Setup Tips checklist. The most important aspect of a saxophone or any instrument for that matter with regards to how it plays is how well if functions mechanically. Yes, some saxophones have a more beautiful and pleasing sound than others, but that doesn’t matter if it is not in good working order. As a former repair technician, I can tell you that there is a lot that can go wrong with an instrument and get in the way of your sound. Make sure you have an instrument that works well and you’re ahead of the game. It’s usually a good idea to take your horn to a repair shop if you’re not sure. All instruments will need regular adjustments from time to time. You may have heard that doing long tones will help your sound. This is true, but it is important to do them the right way. How you use your air and form your embouchure are the key elements to sound production. So you must understand how to do these things correctly to get the most out of your long tones. The part you may not have heard about is that good players are always playing “long tones” even when they are playing lots of notes. The secret is to apply what you do when you are focusing on practicing long tones to everything else you play. Try playing a long tone on your middle C. Take a deep breath and hold the note out for as long as you can with a good sound. Focus on keeping a very steady air stream and maintaining an even sound and intonation. It is not as easy as you may think if you’ve never tried it. Repeat this process using other notes and eventually the entire range of your instrument. How Do I Play With Good Technique? Am I standing up straight? Is my neck straight and relaxed? Am I moving around a lot when I play? Are my feet planted shoulder width apart and straight? Your fingers in an ideal world should always stay in contact with the keys they operate. This is not always possible, but strive to have them touching the keys as much as you can. If they do come off the keys at all make sure it is only the slightest amount and that they immediately return to their correct position. Again the mirror can help you verify this. Keep your hands, wrists and fingers very relaxed at all times. Don’t squeeze the keys really hard. Only apply the pressure necessary to close them firmly. Practice everything with a metronome or some other time keeping device like a backing track or a good drummer. Practice it slowly. Never practice anything at a speed that you can’t play it with absolute rhythmic accuracy. Start slowly and work up. Rhythm is the most important musical element after our sound, and without good technique we can’t have good rhythm. Do not neglect rhythm, and be honest with yourself when it comes to playing in time. You can’t cheat the metronome. 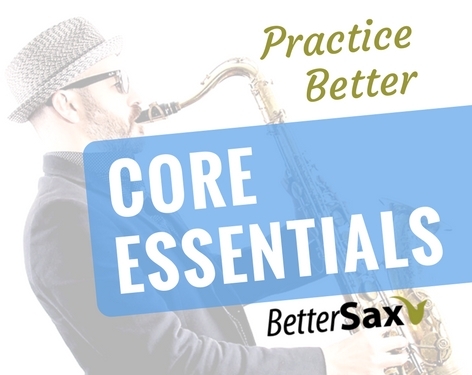 All of these skills are covered in detail in the Core Essentials Program from Better Sax. Click here for more info. Choose one easy key to start with. Concert Bb is a good one (C for tenor and soprano, G for Alto and Baritone) Learn the 5 notes and memorize the scale right away. You may already be working on (or not) major and minor scales. Knowledge of these scales is very important and will help you to better understand the pentatonic scale, but for the moment forget about practicing them. We will come back to these scales at a later point. The pentatonic scale is going to allow us to play with more freedom and play what we hear in our head more easily. Notice how each note in the examples below is assigned a number. This is important. Just knowing the scale is not enough. You need to make this scale a part of you. The best way to do this is to play it in as many different ways as possible. 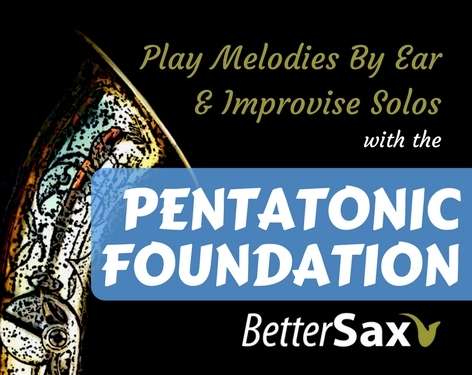 The full Pentatonic Foundation course has several examples of different exercises, but for now, here’s a sample to get you started. In Pentatonic Exercise 1 we simply play the pentatonic scale starting from the lowest note on our instrument that is part of the scale, and continue to the highest in our range and then return back down. From here, there are infinite variations. Try playing the scale up and down 1 octave, but start on the 2nd note instead of the 1st. Now try playing the scale up and down 1 octave but start on each of the remaining 3 notes of the scale. For more on pentatonic scale patterns and how to practice and use them for improvising, check out my eBook that comes with a collection of backing tracks in all 12 keys. Try some of these other variations and make up your own. There are no limits to how you can change things up. Flip everything around and start on the highest note going down. Use triplet rhythms instead of tuplets. Increase or decrease the tempo. Play smaller scale fragments up and down (3 or 4 notes). Skip notes within the scale. Play all the same exercises, but vary the rhythms to add syncopations and rests. Start your exercises on an upbeat. Do all of the above in some or all of the other 11 keys. If you want to play sax by ear, you need melodies. It is best to start with something that is very familiar. You need to be able to sing the melody accurately, before you can do this. Here is a short list of well known songs that are composed entirely with the pentatonic scale for all or part of their melodies. There are many, many more examples. Hopefully, you are familiar with some or all of these melodies since they are all part of our modern standard repertoire and are very influential to the popular music that followed. Remember to start by using only the pentatonic scale from one key as in the previous examples. Make sure you have played through some scale exercises many times so that you are very familiar with the sound of the scale in different configurations. If songs from the above list are giving you trouble to start with, try something like Mary Had a Little Lamb (starts on 3) or Old MacDonald Had a Farm (starts on 1). These songs also use only notes from the pentatonic scale. If you find that you are quickly able to figure out these melodies, congratulations. You have a strong ear. You may even find that you are able to extend this exercise to other melodies that are not limited to the pentatonic scale. This is also fantastic and you should do as much of this as you can to further develop your ability to play what you hear in your head and expand your personal repertoire of melodies. If you are having difficulty, don’t give up. It normally does not take long for anyone who follows these steps to be able to get the hang of it. You may not have thought of yourself as an improviser, but trust me, you can do it. If you’ve followed the previous steps, you should be very comfortable with the pentatonic scale and able to play it in at least one key starting on any of the notes. You should also be able to hear in your head which note from the scale you want to play next, and then find it on your instrument. Now you should understand the basics of how to play sax by ear. This is essentially all you need to start improvising. You don’t have to be Jimi Hendrix the first time you improvise. Just start, and see how much fun it can be. There are some great backing tracks that come with the full Pentatonic Foundation Course that will make even more fun. Improvising doesn’t mean just play anything. It has to come from somewhere. So far we’ve talked about hearing what comes next in your head before you play it. This is especially important when improvising. You’re improvisations should be melodic. Limiting ourselves to the pentatonic scale at first makes this part easy. But, don’t fall into the trap of playing a constant stream of notes just because you can. Good music always has space. Listen to any melody and notice how much space there is between phrases and how she spaces come regularly. You’ll find that spaces will make the notes you play sound better. Try creating short phrases of varying length, separated by spaces of varying length. Your solos will be more musical and pleasing to listen to. You will also feel more in control of what you are playing. Strive to create new memorable melodies with these phrases. Use the spaces to hear in your head what should come next, then play it. If you’ve found this information valuable, I’ve created an interactive video course that covers this system in much more detail. I go through each of the steps in this Play By Ear system starting with the basics you need to get started. Watching and listening to me go through the steps with my saxophone helps it sink in much faster and will make many of the concepts clearer and easier to understand and assimilate. There are 17 individual video chapters in the course, over 90 minutes of focused, to the point instruction. I do not believe in wasting time with a lot of filler. My goal is to help you play sax by ear in quickly. This is one of the tools used by just about all musicians that are serious about improving. You need to play with other musicians to get better and short of having a professional rehearsal band at your disposal, the right backing track is a pretty good alternative. 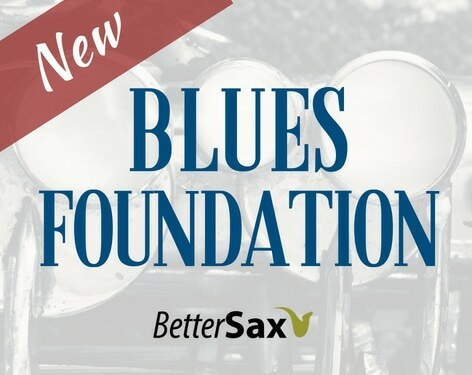 These tracks are specifically designed to work with the Pentatonic Foundation course. The keys and tempos match the exercises and examples in the video lessons. These tracks are yours to keep and download to any device you choose for unlimited listening. Even though you are strongly encouraged to learn all the material by ear and memorize it. You may need some extra help from time to time. 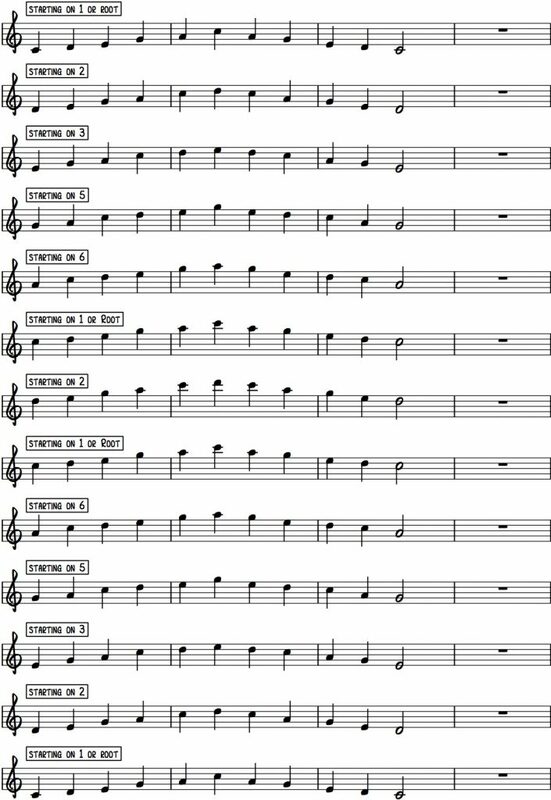 Everything played in the course is also provided in sheet music examples that you can download and view on any device. A recording of an improvised solo played over one of the backing tracks is provided where I play using all the concepts learned throughout the course. A detailed transcription and analysis of this solo provides a great way to more thoroughly understand the material and how to put it into practice. If you’re not 100% sure about what different theory terms mean, it’s all covered in detail throughout the course. We learn about the difference between major and minor pentatonic scales, how to construct them, and how to find their relative partners. One of the best advantages to learning in this way, is having the chance to play through all of the exercises and examples together with me. This is a sure fire way to know if you’re doing things correctly. The Pentatonic Foundation course also comes with a pdf guide book. This guide has all the information from the course and serves as an excellent reference if you would like to print it out or view on a tablet or computer screen. Separate versions of the course are available depending on the instrument you play. With your purchase, you get access to both. 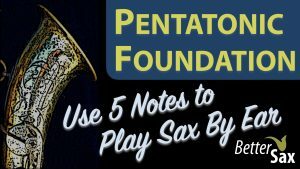 With your purchase of the full Pentatonic Foundation Course, you have unlimited access to the videos, backing tracks and pdf documentation. Thanks for reading this article. 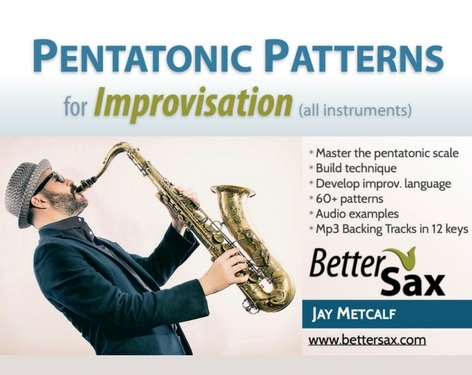 We’d love to hear from you if this information helped you get started using the pentatonic scale to play sax by ear. 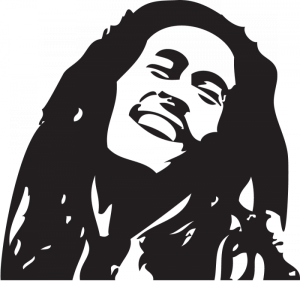 Please leave a comment below and tell us about your experiences with the pentatonic foundation. I am a bariton sax player.